The secretary desk, also known as a “secretaire”, is made of a base of wide drawers topped by a desk with a hinged desktop surface, which is in turn topped by a bookcase usually closed with a pair of doors, often made of glass, for those who perhaps have not seen one before, the secretary desk in a "mélange" of furniture pieces made up of a mix between a commode-dresser, a slant top desk and a book case first became popular around the 17th century. As the design began to evolve and adapt to modern day amenities, the slanted writing surface ultimately was replaced by a flat pullout design that is better suited for computers and keyboards. 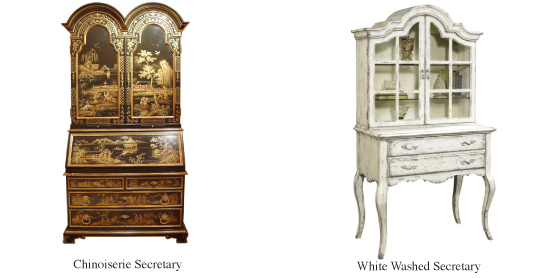 Selected antiques and custom furnishings can be very decorative and because of its popularity, the "secretary" (not to be confused with the person that takes notes) has grown to be the most common. Today, one can find an endless array of reproductions from a string of manufactures and designers. 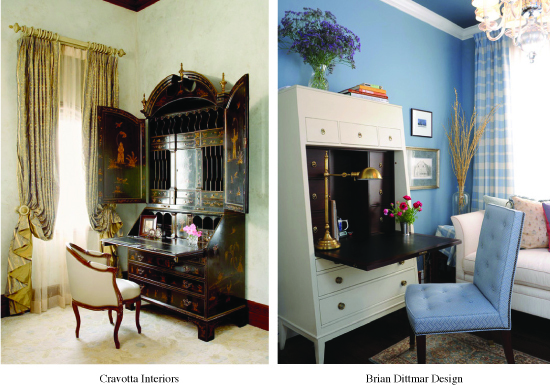 Below is a custom made secretary that I created for a recent bedroom redesign. My client’s wife wanted a functional but yet beautiful piece of furniture for her bedroom that she could use to organize stationary and personal items. Secretary desks are great for storage; they’re versatile enough to fit into almost any home and can be tailored to fit your design aesthetic. In addition to serving as a storage unit and desk space, the secretary can also be used as a display case. By throwing open the top tier one can easily showcase treasured collectibles while keeping clutter neatly stored away.